One of my favorite bird dog stories made into a b&w movie in 1940. I looked for years to find a copy of it and now you can see it in it's entirety online. Thanks for the fine work that you do at putting together and maintaining the Strideaway site. It's top notch! I like the new hats too! Indiana dog, Touch's Whiteout had six finds in judgment, a strong finish, and a seventh find after time. Owned by Keith Wright of Covington IN and handled by Ike Todd. West coast lady handler Lori Steinshouer gets setter around 3 hours clean with 3 finds. From the Ames site...Partly Cloudy; breezy. Highgrond Jax Jabba had three finds and finished the three hours. Take your medicine Beano. Your thought process is warped. Nominations to date from the Ames Plantation site. 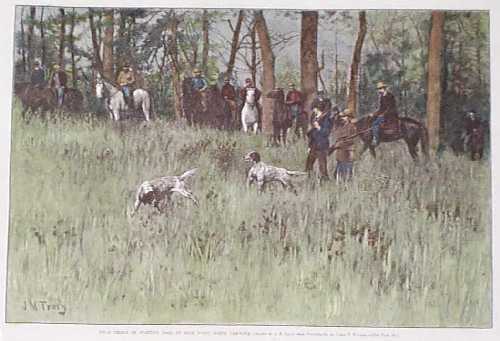 Here's one of Tracy's works that appeared in Harper's Weekly magazine depicting an early field trial at High Point N.C.
Got it but didn't open it. looked suspicous. Handling different gamebird species can create problems for dogs and their handlers. Thats what field trials can do... seperate good dogs and their handlers from ones less talented. It's Ok to name your field trial friends names and what venues they compete in. Topic: anyone experienced a dog that cant scent birds?! Re: anyone experienced a dog that cant scent birds?! Topic: Best nose on an EP? Re: Best nose on an EP? Crow's Little Joe's pedigree shows he decended from a line of a number of great horseback trial champions. Branscom's Nickle < Pike Creek Mike, HOF Red Water Rex, Tiny Wahoo, Ennis Drug Delivery, The Texas Squire, Riggin's White Knight etc....The fruit does not fall far from the tree. first you must live it."